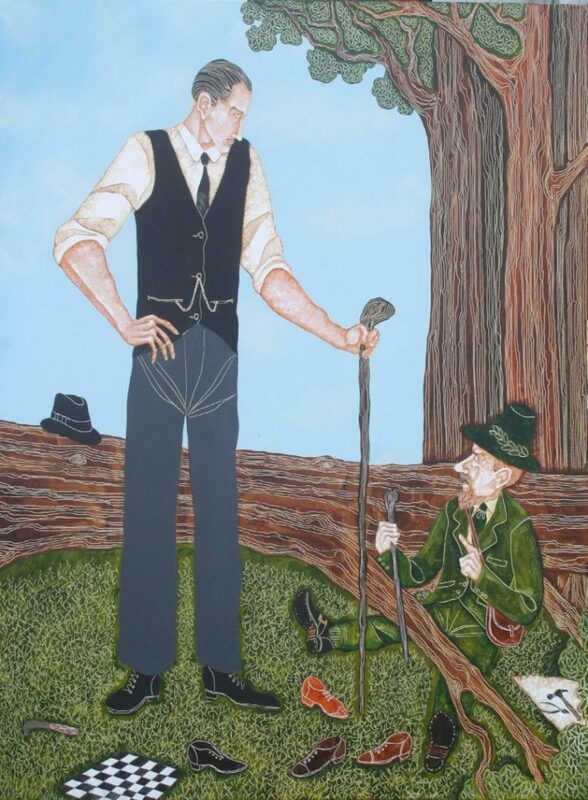 And so it all began with my grandad and the Leprechaun. He was a great man for singing and stories. His generation were happy to turn the television off on a Sunday evening and fill the silence with word-conjure. As I look back now, I see him in his mustard cardigan and suede shoes. His dentures gleam and his hair is Brylcreemed back, as slick as an otter’s pelt. The false teeth give his speech a whistling quality now and then. When he tells stories he often runs an open palm over his oily hair. I am eleven years old and he is not much taller than me. Spare and dapper; when he sings he stands by the fireplace with one hand behind his back. There is a bantam dignity about him. He loves to scare us. Sometimes he puts one of my grandmother’s shawls over his head and rises from behind the sofa as the very likeness of the banshee. My brother, my sister and I laugh in a scared-ticklish way. Such is the theatricality of his moaning and hunching over us that we never really believe his banshee story. But with the story of the Leprechaun it was different. He will tell us about his encounter with the little man in a matter of fact way, in much the same tone as when he recounts his reminiscences of his own raw and half-starved childhood, or when he used to hunt plovers for the gentry. So although I am eleven years old, I am only just beginning to question the veracity of the story. It certainly has no less a ring of truth to it than his claim to have cycled sixty miles there and back in one night just to go to a party. Imagine you take a picture of us with a 1970’s Polaroid camera. The gaudy orange and yellows of the instant photo shows an ordinary family in a neat small house. My father and mother are smoking and sipping their third cup of tea. My grandmother is ironing. We three children are on the sofa. Grandad is in his armchair. He keeps himself busy doing a bit of painting and decorating and he al- ways wears a collar and tie under his overalls. The talk passes through Mrs Knight’s new bathroom which he finished last week, to the next job at the doctor’s house. My father mentions the sunset the night before, when he and I were walking our dog Jasper along the beach. Grandad has that Irish way of quietly agreeing by giving a soft intake of breath, like a sigh in reverse. My father stops speaking and there is silence. There are dark corners in the sitting room. Grandad looks around and says, ‘It puts me in mind of the evening I met the Leprechaun.’ And to the hiss and sweep of my grandmother’s steam iron he begins to lay before us the tale of his encounter. ‘When I was a young man I was coming home one late afternoon in April. It had rained but I had been working all day in a barn, cutting turnips. I remember that the rain had just passed and the fields were all washed new. I climbed over a wall to take the short cut home. The grass wet my boots, especially the one with a hole in the sole. I crossed the field and had to skirt a little wood. It was not far from Kildangan. I could see the smoke coming from our chimney. I was just passing by the trees when I noticed a movement. In those days we always carried our jackets over our shoulders if we could, to be ready to throw it over any stray pheasants. You had to be quick and careful. We needed the meat but the law was against us in that matter; you could get prison for poaching. Anyway, I pricked up and looked again to where I had noticed something moving. Well, the sight of it nearly had me running the other way. I felt like rubbing my eyes to see if they were cheating me. For there, by the bank of an old ash tree, squirming and muttering was a little man lying on the ground. I went up to him with my heart knocking on my ribs. Yes, he was a little man right enough, about the size of a five year old child and he was dressed in a frayed green coat. He had a crumpled, wrinkled face and he was wearing a tall battered hat. As I came close I could hear him cursing and, oh, the swearing and blasphemies. It would make a sailor blush. I suppose the length of my shadow gave me away for he looked up in the midst of his carrying on. He flinched, but then straightaway he seemed to change his demeanour. “Well hello Martin O’Brien,” he said in a little voice that sounded something like a door hinge creaking. “Wicklow is very long way from here,” I said. The little man’s hazel eyes flashed with annoyance. “I walk very fast,” he said. “Do you now?” I said, quiet like, as if I wasn’t the least bit interested. For the notion had come upon me that the fellow was none other than the Leprechaun and I wanted to think about a plan of action. You have to be very careful when you deal with the ‘good people.’ Get yourself prepared and be as polite as you can. I drew even closer and had another long look at him. He was like a cross between a tramp and fox. He smelled of the damp woods. “Well then, let me see,” I said, as I knelt down. I ran my hand the length of the root. It was a thick one. However, I was strong in those days and, closing my fingers around it, I gave it a great wrench. Now, what occurred next, happened in an instant. I was strong but I was also quick and I knew I had to be on this occasion. As I pulled the root up the Leprechaun gave a great yelp of relief, but this soon turned to a wail, for I had caught him, in mid-leap, by his left ear. “Aw, not that! Not that!” He wailed, and it was like the grief of a cat at midnight. “You’ll have me ruined,” he cried. “I never had you down for such a Rapparee, Martin O’Brien!” His tawny eyes filled with tears of rage. He gave one last wail and then became quiet. “Alright, alright,” he said, taking up a little twisted blackthorn stick. He led me out into the field and then through a gate into a pasture where an old donkey was grazing. All the time I had him by the ear and all the time he was grumbling at the injustice of it all. Several times he looked up at me sideways and several times I nearly tripped over molehills that seemed to spring suddenly up from the grass. But I was ready for these antics. He was just trying to shake me off. I pretended I hadn’t heard this last insult. “Now before I let you go, I must have a promise from you sir,” I said. Pain creased across the Leprechaun’s face. “Aagh! You have my promise.” He squealed. “Good enough,” I said. As I let him go a great sudden wind knocked me on my back. When I sat up the Leprechaun was gone, but the stick was still there. Where I had nipped him between my finger and thumb I had a sore rash as if I had touched a nettle. But that scarcely troubled me. I ran across two fields as if my shirt was on fire, then over the wall and up the boreen to the house. The sunset was on my back. My boots clattered in the yard and there was my spade leaning against the wall by the door. Back, like a hare, down the boreen and over the wall with my spade over my shoulder. Now the big red sunset was in my eyes and lust for the buried treasure was in my heart. I would be a rich man! I would buy new boots, a fine suit of clothes and a big house with roses in the garden and carpet on the floor. I leapt the wall like an acrobat (I was fast in those days) and across the two fields rapidly closing the distance between me and the braying donkey. There was a lash of sweat on my brow, but I was giddy with fine speculation of the treasure. Gold coins lying in the black earth. The Leprechaun’s old hoard of stolen money. Soft, generous gold. Enough to set a man up for life. I got to the gate and vaulted it, landing in the pasture on two feet. And the groan that came from my throat was like a man dying of disappointment. I stood there with my chest heaving and I threw my spade on the ground in anger. For the field was staked and pricked by ten, twenty, or thirty thou- sand polished little blackthorn sticks, all exactly the same. The poor old donkey was completely stockaded by them. They were almost as common as the blades of grass. The Leprechaun had kept his promise but he had also tricked me. I couldn’t dig up the whole field, so I loped home in despond, and I have never been a rich man. In four years my grandfather would be dead. He took with him all his de- light in the quizzical and the ghostly and the tragic; the sense of a tricksy otherworld, very close to our own. Also the notion of a threshold between these dimensions that was almost casually crossable. I have had my own encounter with the Leprechaun. When I was in my early twenties I left a friend’s house in the early hours of the morning. We had been drinking. I was staying back with my parents for a few weeks. My friend’s house was down towards the sea on a very grand avenue, with trees all along the centre. New street lights had been installed but as it was after midnight it was almost pitch black. I was singing to myself to keep my spirits up, for I have always been afraid of the dark. As I neared the top of the avenue I saw a light to my right. That was Jefferies Lane which led to some old flint-walled houses that had been surrounded by 1930s villas. There was one iron street lamp there from an earlier age. I still have no idea why this one lamp was still lit when all the others were dark. I walked on past the lane but had a great bolt of sudden shock when I saw a little man dancing in the yellow compass of the light. I stopped quite still, but every muscle in me shouted that I should run like the wind all the way home. There he was dancing in the light, his tiny face looking straight at me. His white socks flicked in a quick-step jig. In an instant I saw that it was an illusion. It was, in fact, a cat running to- wards me. The dancing flash of the Leprechaun’s socks were the cat’s white paws. It might seem daft but for a second I really had believed I had seen the Leprechaun. Stephen O’ Brien is the editor of The London Magazine.